This is the 2nd in a series of articles looking at the software applications available for Linux. Last week I wrote a guide to the Thunderbird Email Client. 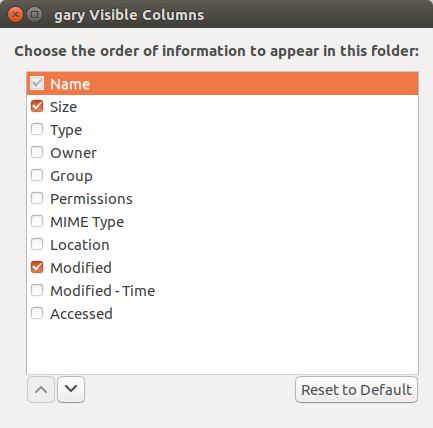 Nautilus is a very popular file manager so if it isn’t installed for your particular distribution you should be able to find it in the graphical package manager. 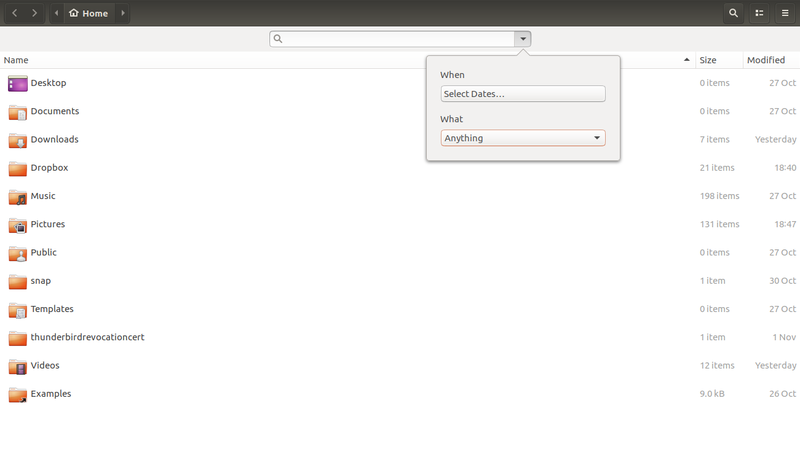 Nautilus is the default file manager within Ubuntu Linux. In other distributions you should be able to find it using the menus provided by the desktop environment. 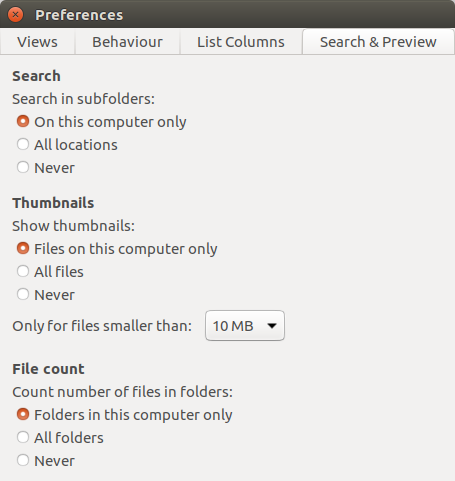 Nautilus makes it possible for you to navigate around your file system. You can also create an delete folders, compress files and folders, share folders, connect to network drives and change file and folder permissions. The left side of the screen provides a list of common locations. You can instantly access recently viewed files, the desktop, your documents, downloads, music, pictures, videos and files that you have deleted. You can also view other locations such as other partitions such as Windows partitions network shares. The right panel shows the current folder that you are looking at and you can see all of the sub folders and files within that folder. The top left corner of the screen has a menu with options for creating a new window, whether to hide or show the side bar, preferences, keyboard shortcuts, help, about and quit. The top bar of the Nautilus window has left and right arrows which lets you go back to the previous folder you looked at and go forward again. 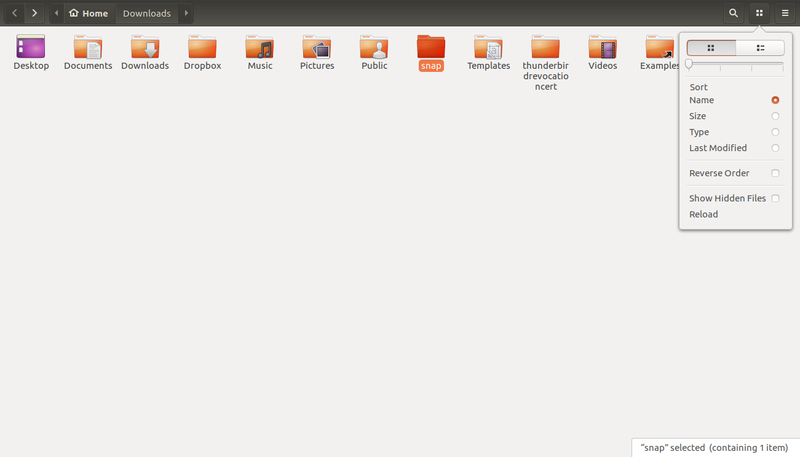 Next to the left and right arrows is a bread crumb trail which shows the top level folder and the sub folders. This lets you know where you are in the tree. On the right of the top bar there is a search icon which when clicked shows search options as highlighted by the image above. You can also search by file type which includes every file type you can think of and you can choose to search for files or folders. 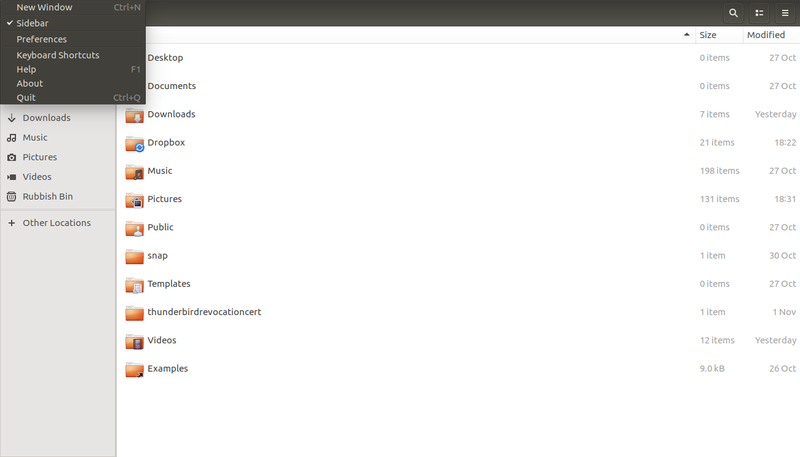 I have already mentioned that you can hide the left bar by selecting the file menu and unticking the sidebar option. You can also change the view of the main output by clicking on the icon next to the magnifying glass on the top bar. There are basically 2 main views, the first is a list of icons and the second is the default view which is a list of files and folders. By default only name, size and modified date is displayed on the list view but you can amend the list of columns by clicking on the visible columns link. The available columns are name, size, type, owner, group, permissions, MIME type, location, modified date, modified time and accessed date. You can change the order of the columns by using the arrows at the bottom of the screen. As well as changing the available columns you can also choose whether to show hidden files or not and you can change the size of the icons and text by dragging on the slider. The grid view shows a list of icons as shown in the image above. You can sort the icons by name, size, type and last modified date. You can also reverse the order. As with the list view you can choose whether to show hidden files or now and you can change the size of the icons by dragging on the slider. At the end of the top panel there is an icon with three lines on it which brings up a menu. 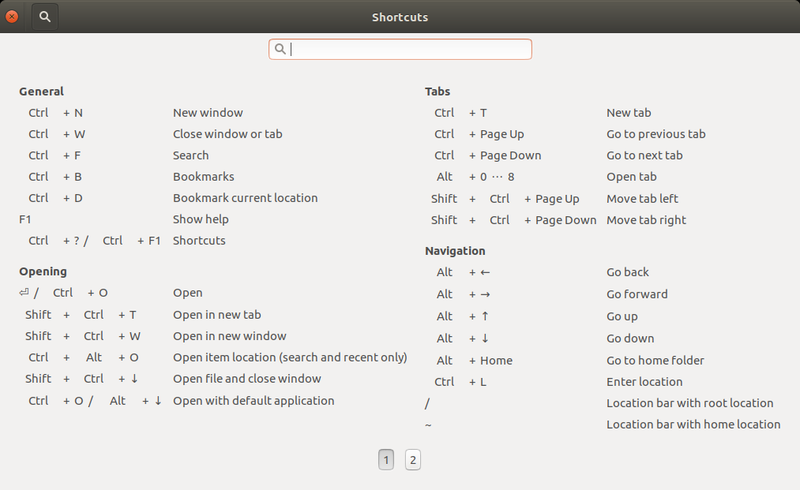 The menu enables you to open a new window within Nautilus or indeed a new tab. If you have deleted a file or folder you can undo the deletion or indeed redo the command. You can select all of the files and folders in the panel. The enter location option shows a full address bar and you can use this to navigate higher in the tree or indeed if you want to connect to Samba shares you can enter the path here. Finally you can bookmark a folder which places it in the left panel. Right clicking in the right panel brings up a context menu. 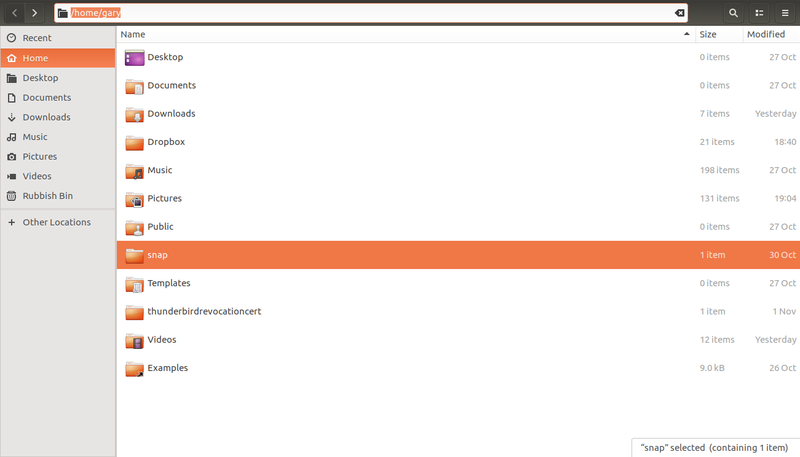 If you click on a folder you will be able to open the folder either in the current panel or in a new tab or window. You can also open it with another application. You can of course perform file system commands such as copying and pasting and move the folder to other locations on the drive. You can also delete and rename the folder. If you right click on a file you can open the file in another application and perform all the file system commands such as copying, pasting, deleting etc. You can also send it as an attachment to another email account. 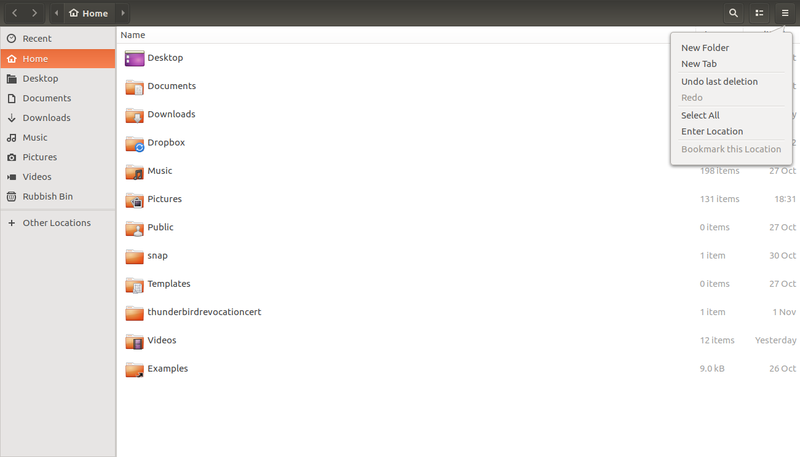 Drag and drop works when moving files and you can have multiple Nautilus windows open to make this easier. 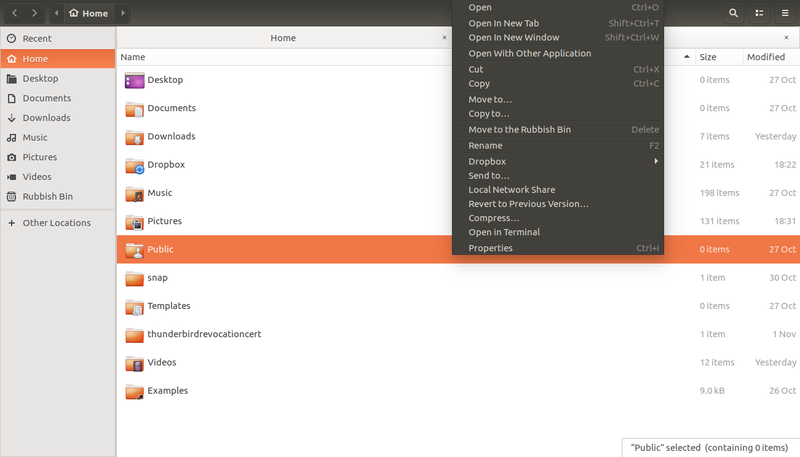 On the context menu you will see an option called “Local Network Share”. When you click on this option the file sharing window will open. Click “Install Service” and Samba will be downloaded and installed. If Samba is already installed on your computer you won’t obviously see this message. When the file sharing service is installed you will be able to share the folder. All you have to do is give the share a name. 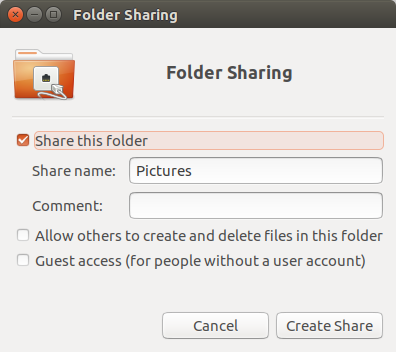 You can choose whether to allow others to create and remove items from the folder and whether guest users can access the folder. When you right click on a file or folder the context menu that appears will have an option for compressing that file or folder. You can of course select multiple files and folders. You can select multiple items by left clicking on one item, holding the shift key and selecting on another item. This will select all items between the first and last item selected. Alternatively left click on the first item and then hold down the CTRL key and click on subsequent items to select. When you have all the items you need selected right click and choose compression. 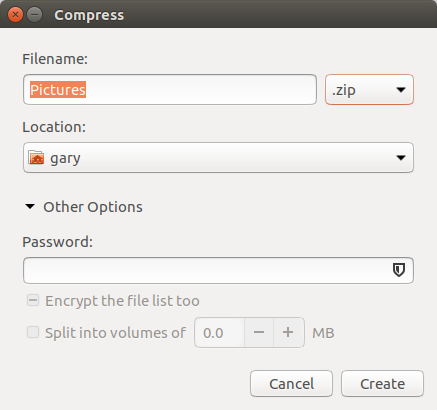 You will be able to give your compressed file a name and you will be able to choose from a number of different compression types including zip, gzip and bzip. If you choose a zip file you will be able to password protect the file. When you right click on a file or folder you will be able to choose the properties menu item. The properties window will appear and if you are viewing a folder you will see three tabs but for files you will can see either 3 or 4. 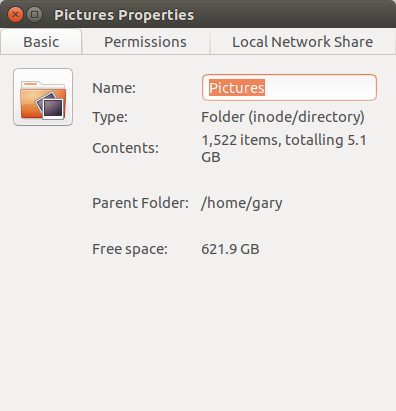 For a folder you will see “Basic”, “Permissions” and “Local Network Share”. The “Basic” tab shows the name of the folder, the type, the contents, the parent folder and how much free space there is. 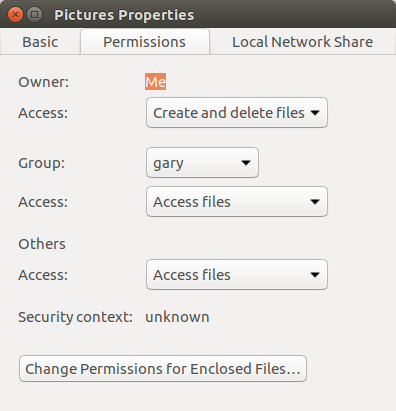 The permissions tab lets you choose the permissions for a folder. You can change the access rights for the file owner, the users in a group and for everybody else. The local network share tab is the same as the one shown when choosing share from the context menu. The basic and permissions tabs are the same as the ones for folders. 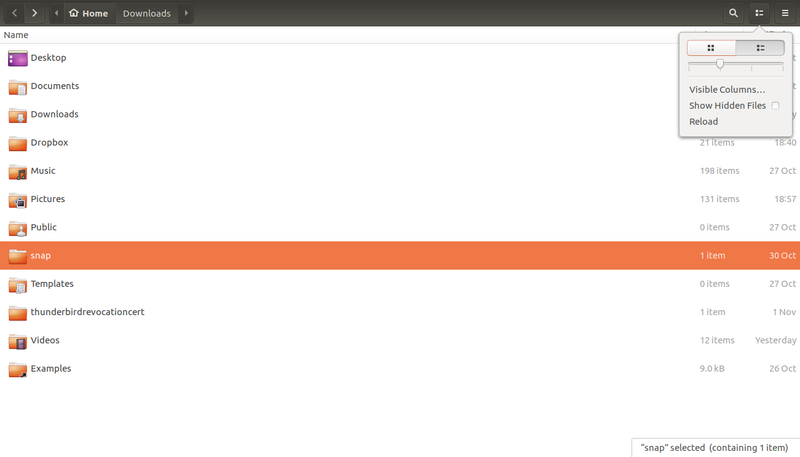 The open with tab lets you choose which application is used to open a file. 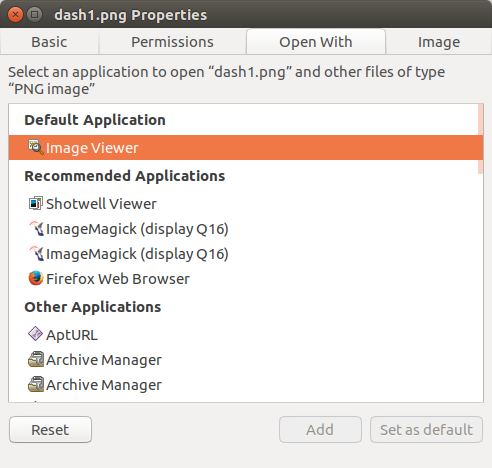 The default application is shown first followed by recommended applications and other applications. To set a different application as a default click on it and click “Set as default”. 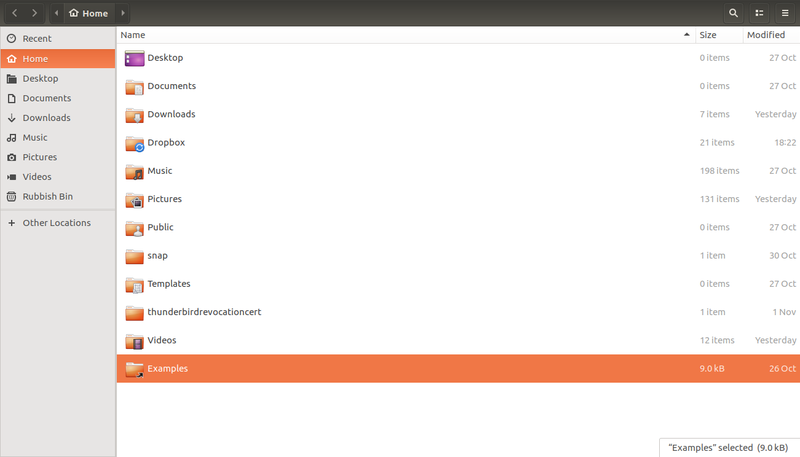 The recommended applications will be displayed when you right click on a file and choose “Open with other application”. To add more applications to that list click on the application from the “Other Applications” section and click the “Add” button. You can delete a recommended application by right clicking and choosing “Forget Association”. 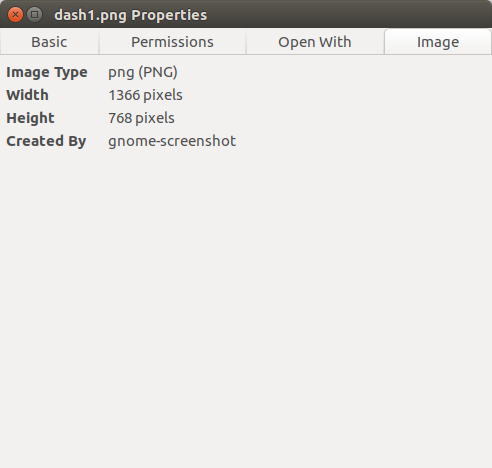 The “Image” tab is only displayed for image files and it simply shows the type and dimensions of that image. 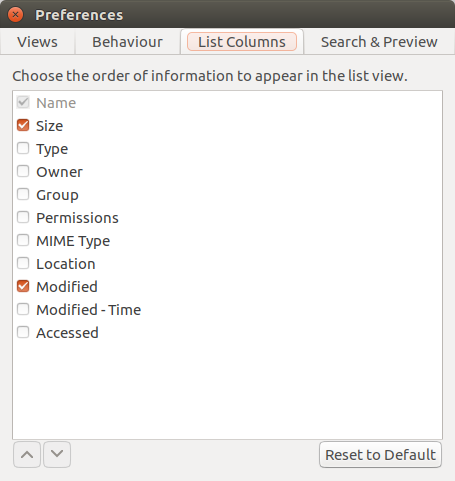 Under the file menu there is an option called preferences which when clicked lets you change some of the settings within Nautilus. There are 4 tabs available. The views tab lets you choose whether folders are sorted before files so that folders will always be at the top (or indeed bottom if you search in reverse order). 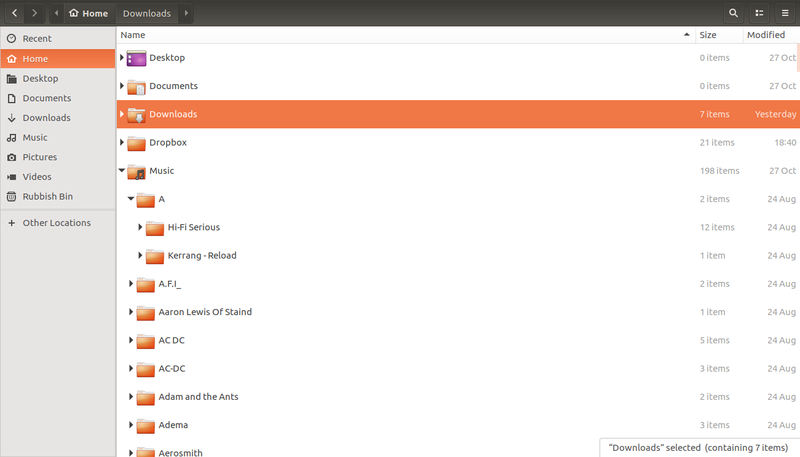 When Nautilus is in list view you can choose whether folders can be expanded. By default the option is set to not expand but as you can see from the image above by having this option turned on you can add a treeview effect. 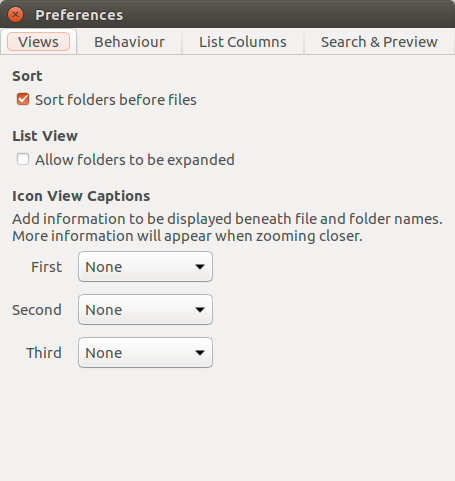 The behaviour tab lets you determine whether a single or double click is required to open files or folders. By default Nautilus doesn’t let you create symbolic links (which are like shortcuts) but by clicking on the “Show action to create symbolic links” option you will be able to do so from the context menu. 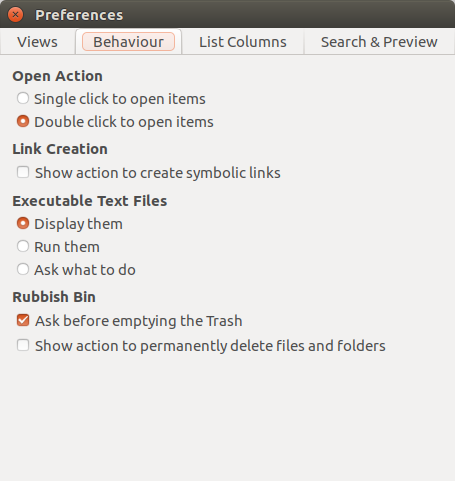 You can also determine how executable files behave and determine what to do with files in the rubbish bin. The list columns tab provides another way to determine the columns that appear in the right panel. Finally there is the search and preview tab. When searching you can choose to search sub folders on this computer, this computer and all other locations such as network shares or not at all. You can also choose how thumbnails are shown and the way file counting works. 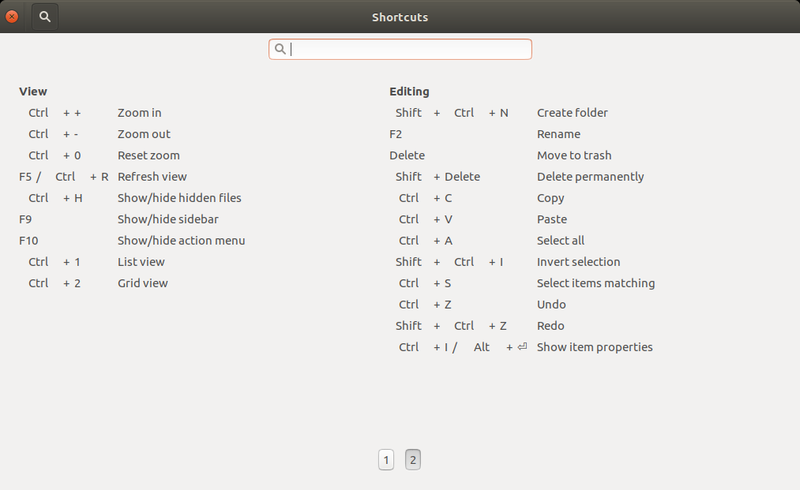 If you are a keyboard warrior then you can improve your productivity by learning the abundance of keyboard shortcuts that are available within Nautilus. File managers are often taken for granted and most of us scratch around using the bare minimum features but you can use Nautilus to connect to network drives, compress files and perform all manner of tasks.